Though not actual candy, these veggies taste almost as sweet. Roasting broccoli and cauliflower at a high temperature has the wonderful effect of caramelizing them, bringing out their natural sweetness. I love to bring these two vegetables together. Cauliflower delivers a mellow sweetness that is the perfect foil to broccoli’s more intense, cabbage-like flavor. Broccoli florets, however, will cook much faster than cauliflower florets. So instead of separating cauliflower into florets, I thinly slice it. That way I can toss the two vegetables onto the same tray and cook them for the same amount of time. I’m all about efficiency. When I was struggling to get my kids to open up to these vegetables, I found that roasting them worked a charm. No big surprise there. Most 8-year olds have a pretty healthy sweet tooth so caramelized roasted vegetables were like a revelation to them. Sure this dish will never replace their love of Halloween candy, but it’s nice to have them coming to the dinner table looking forward to the veggie side. When it comes to a plate of vegetables for a pair of little boys, really, can you ask for anything more? This recipe is just about the simplest rendition of what you can do with cauliflower and broccoli, perfect for the whole family. By all means, though, jazz it up with your own additions if you like. When I feel like getting fancy, I mix in everything from pistachios to raisins, curry powder to cumin. But when I just want to get a plate of nicely cooked vegetables to the table quickly, this is my go-to recipe. To prepare the cauliflower, slice the head in half and then into quarters. Slice out the inner core, then slice horizontally into each quarter to create roughly 1/2-inch-thick slabs. On a large rimmed baking sheet, place the cauliflower slices, broccoli florets, and garlic slices and drizzle over the oil. Toss to coat all over with the oil. Season to taste with salt and pepper and toss again. Bake for 15 minutes, until tender and turning golden. Sprinkle over grated lemon zest and serve. 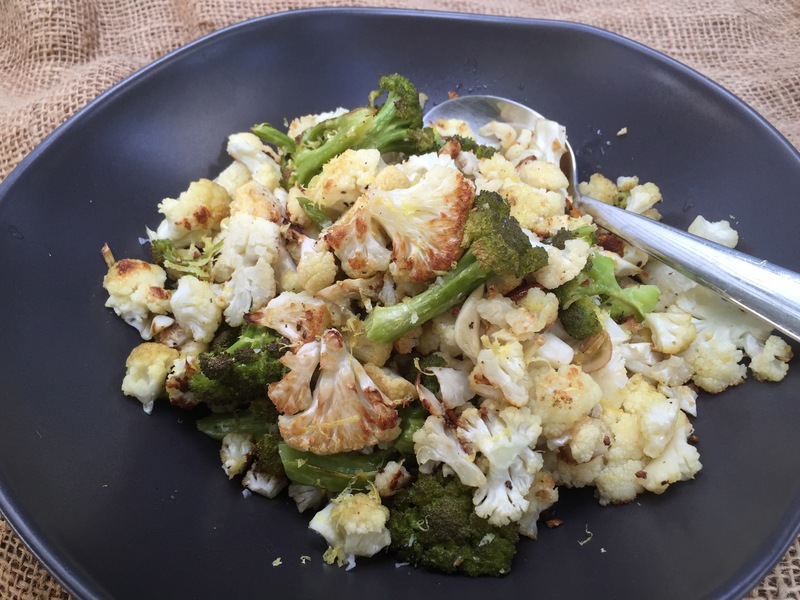 This entry was posted in side and tagged broccoli, cauliflower, roasted vegetables. Bookmark the permalink.